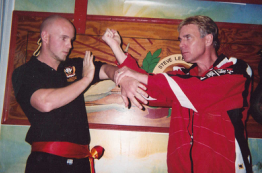 Grandmaster Steve Lee Swift teaches traditional Wing Chun Kung Fu forms and techniques along with modern applications. Grandmasters Wing Chun will give you the information that you need to save your or another’s life in REAL LIFE SITUATIONS. We provide real fitness and real martial arts, for real life people. Give yourself a fighting chance. Our classes for kids teach children NOT to use FORCE with FORCE. 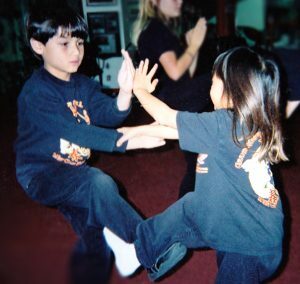 We teach REAL self-defense to children of ALL ages from the littlest of dragons to the biggest.We at Grandmasters Wing Chun feel that it is our responsibility to teach each child the in’s and out’s of self-defense in REAL WORLD SITUATIONS! Your CHILD needs to know how to stop a MAN or WOMAN from trying to steal or drag them from any situation. Can you say to yourself at the end of the day that your child won’t use STRENGTH to fight a much larger ADULT? What is the SIZE of your child or even yourself in comparison to that of an attacker? Will that attacker really give you time to stop and think about your next move? Will that attacker give you time to step back to ready your attack, to step back and ready your kicks? OUR KIDS CLASS teaches your child to attack vitals, to use the body’s natural strength through the body mechanics of Wing Chun, which was passed down by a FEMALE Shaolin Monk. Using these body mechanics, she was able to take down much larger and stronger opponents. She passed down this art as a means of protection. Is your child truly ready? Are you? See what we have to offer at Grandmasters Wing Chun and you will find the difference. Please call for to arrange private lesson times and scheduled dates. * Personalized Training by Appt. Grandmaster Swift occasionally holds special seminars which cover more complex subjects within the art of Wing Chun. These are usually held on Sunday from 6:30-8:30 PM. Please call Grandmaster Swift to find out when the next scheduled seminar will be held.